I look at a bottle cap and see an unfortunate piece of trash, Steven Beatty and Laurel Kurtz look at a bottle cap - make that several thousand bottle caps - and see art. 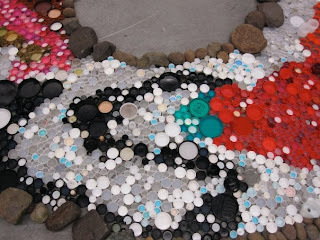 Beatty and Kurtz started collecting caps in 2006 from friends and family, bins at Portland State University, and even craigslist. Several thousand caps later and they have had four major art installations designed to raise awareness of the environmental impact the small pieces of plastic have. Their latest installation, Flotsam & Jetsam and Jetties & Gyres, makes reference to cast-off debris - such as bottle caps - that ultimately end up in the ocean and congregate in the North Pacific Gyre. 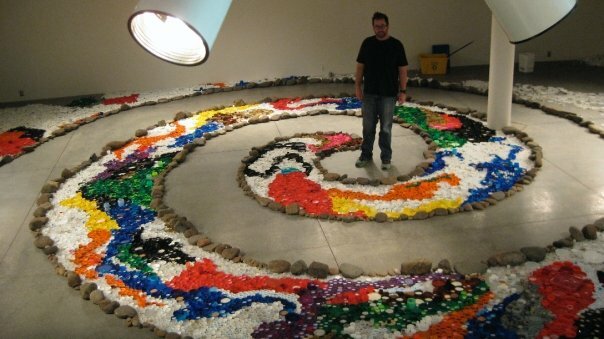 The exhibit at Clark College's Archer Gallery in Vancouver, Washington is a 42-yard spiral made entirely of various colored caps. 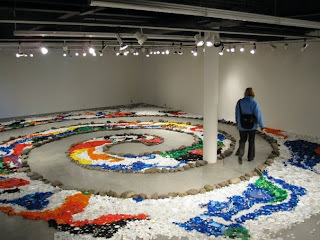 Visitors enter the exhibit from a single point and stroll through the debris, making their way to the center of the spiral much the same way jetsam at sea enters the gyre. When I asked the artists how many caps they have collected over the years, the only answer they could give me was, "A LOT". The installation, that took a week to set up, can be viewed now through December 10. If you live near Vancouver and do not have access to Aveda for recycling caps, a collection bin will be on site during the exhibit. The artists only ask that you wash them before donating. "After a while they start to smell like compost," Beatty said. Beatty and Kurtz have spent countless hours bathing the caps in bleach to prepare for the show. An estimated 80 percent of garbage in the North Pacific Gyre, dubbed the Great Pacific Garbage Patch, is from land-based sources. The actual size of the Great Pacific Garbage Patch is unknown. Since it consists of confetti-like pieces suspended below the water's surface it is not visible by aircraft or satellite, but is estimated to be twice the size of Texas. A study in 2001 found that concentrations of plastic in certain areas reached 1,000,000 per square mile. Knowing that there are people like Steven Beatty and Laurel Kurtz doing their best to keep "A LOT" of plastic caps from ending up there... now there is an impact. what are they going to do with the caps afterwards?? 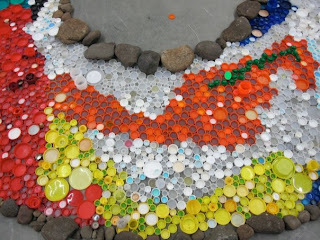 You are on a bottle cap-reduction mission! 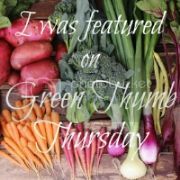 I love it and, like Eco Yogini, have also begun saving mine since your Aveda post. I had asked about the caps future, I think they may end up being used in Juicy V. (This installation is Juicy IV) I made sure to tell them about Aveda's recycling program, so who knows, maybe one lucky Aveda will end up with a surprise drop-off of A LOT of caps!